If one were to type “black hole” into Google, they would retrieve this definition from Wikipedia: “A black hole is a region of space-time exhibiting such strong gravitational effects that nothing—including particles and electromagnetic radiation such as light—can escape from inside it”. In my own words, a black hole is a highly dense form of matter, that makes a depression in space-time in which no date can be retrieved from. Some terms we will need for this page are “singularity, event horizon, accretion disk, and Schwarzschild radius”. Let’s start from the inside and work our way out! The above image shows a depression in space-time caused by a black hole. 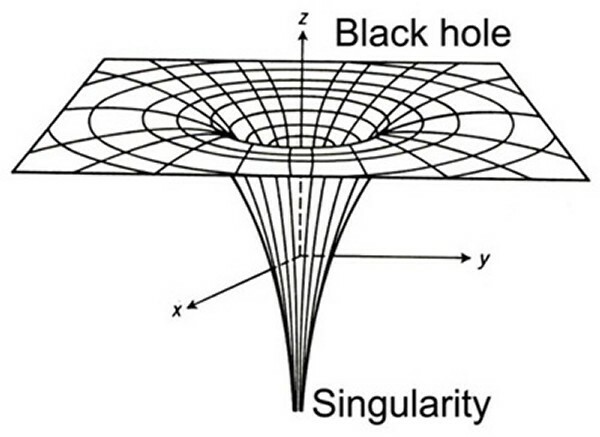 The singularity can be described as the center of the black hole, or more accurately, the point where space-time curvature and gravity essentially become infinite. Remember, infinite in science doesn’t necessarily mean infinite. Normally, this is a point where our physics break down. The event horizon, often spoken of in cheesy (and sometimes great) Science Fiction, is simply the point where space-time curvature becomes so high that not even light can escape from it. We can think of the event horizon as a veil that hides the singularity at a black hole’s heart from our view. 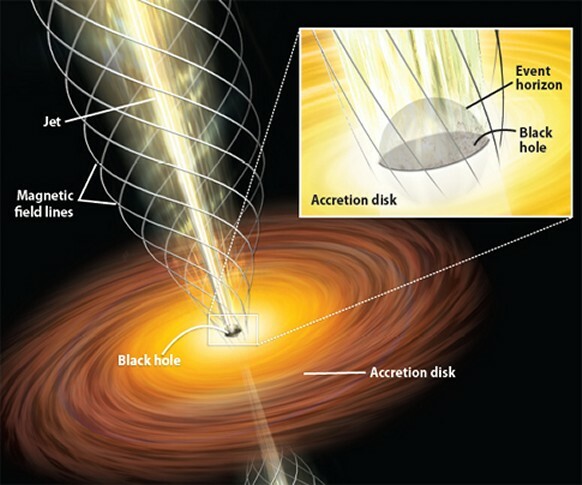 The accretion disk (simply put) is the swirling, luminescent disk around the black hole. These are made up of dust and gas that have entered orbit around the black hole. Accretion disks are not solely a property of black holes. Any massive body, under the right conditions, will have an accretion disk. It is a common idea of modern astronomy that the planets of solar systems form from the accretion disk around newborn stars. Remember, entering orbit does not mean “being pulled in” by the black hole. This mass is no less in orbit than a GPS satellite is around Earth. Of course, this can be a different story considering how the objects and gases interact, knocking some things closer to the horizon. Since one cannot see beyond the event horizon, a very bright accretion disk is a great indicator of a black hole’s presence. Here is the equation for the Schwarzschild radius of any spherical object. That is the math part, but let me go on to explain what all this actually means. Imagine that someone were to squeeze the Earth from all directions. For this idea let’s assume there is no one on the Earth as things will get ugly very quick. Earth’s escape velocity (given it’s size, mass, and density) is 11.2 kilometers/second (or 6.96 miles, second). Thanks to Wikipedia for the values! But as the Earth is compressed, we see higher density and greater curvature in space-time. Greater curvature means more difficulty reaching escape velocity. At a certain radius the escape velocity for Earth will become, and if we keep compressing, exceed the speed of light! Sound familiar? What I am talking about here is how objects achieve black hole status. It would take some crazy processes not known to turn the Earth into a black hole, thankfully! The radius at which light cannot escape a compressing (or collapsing) object is called the Schwarzschild Radius. It’s name comes from the same man that gave us the Schwarzschild solution to Einstein’s Equations. If one plugs in the necessary values into the above equation, the Schwarschild radius of the Earth is 8.87×10-3 meters, or roughly 9 millimeters, the size of a marble! A great table showing values for the Sun, Earth, Milky Way, and other objects exists here. HOW COULD SUCH A THING AS A BLACK HOLE FORM? NEXT UP, WE WILL COVER CURRENT THEORIES ON HOW THESE OBJECTS COME INTO BEING!